My three-year-old son loves trains so taking him on for a ride on the West Somerset Railway, the longest heritage railway in England, was a real treat. We started at Bishops Lydeard near Taunton, and took the steam train to Dunster, England’s largest medieval village. What an absolute delight this trip is – for grown ups as well as little ones. We left really early to get the first steam train of the day, following the signs to the large car park, which is right next to the station. And what a station! It felt like we were on a film set – I half expected Poirot or Miss Marple to join us on the platform at any moment. Instead, we were greeted by the nicest, friendliest staff ever, which really shows what happens when you put a service into the hands of people who are so passionate about it. We bought our Family Ticket in the ticket office (although you can get a discount if you book in advance online) and were ready to go. There were lots of keen photographers on the train (me included! ), jumping out of their seats to take photos of every new view. It really was a lovely scenic journey, although of course the highlights were the steam trains themselves and the pretty, perfectly preserved stations that they called at. We were lucky enough to sit next to a train enthusiast who told us which window to look out of to see the steam train passing the other way, and there were lots of squeals of excitement when we spotted it. There was a buffet on the train with hot and cold drinks and snacks, but remember this is a olde worlde railway, so bring some cash to pay for your food, as they can’t take cards! When we arrived at Dunster station, another friendly volunteer gave us directions to the village, which is about a 20-25 minute walk along the riverside. If you would prefer a more leisurely trip, check the website for the “Dunster Castle Express”, which runs on certain days and includes a bus transfer from the station to the castle. Dunster is England’s largest medieval village, with a castle (run by the National Trust) towering over a picture-postcard high street and Yarn Market. We had a delicious, relaxing lunch in the gorgeous ‘Old Kitchen Bar’ at the Luttrell Arms, with a roaring log fire, and plenty of history and character. Rather than have pudding at the hotel, we stopped in at Styles, which sells their own homemade farmhouse ice cream and ‘Slim Ewe’ sheep’s milk iced desserts, as well as other locally made goodies. We took a leisurely walk back to the station licking our cornets of chocolate, toffee and butterscotch, and mint choc chip ice cream. Back at the station, we waited on the platform to board our return train back to Bishops Lydeard. The train line is really straight here, so you can see the steam train slowly approaching, which certainly builds up the anticipation on the platform. As the train came into the platform, the steam billowed, and all the children went wild! On board, we found a table and spent the whole journey talking animatedly about all the things we had seen and done. My children were beaming from ear to ear and we all can’t wait for our next trip. The West Somerset Railway is very family friendly. If you want a really special day out for your children, check the website for family days out – they run events throughout the year and you may be lucky enough to spot Paddington Bear, Peppa Pig or even Thomas the Tank Engine! There are many events for grown ups to enjoy too, including the very Somerset ‘Cheese and Cider’ special, ‘Steam and Cream Tea’ and Murder Mystery trips. Look out for the Dunster Express, Hestercombe Express and Lynton & Lynmouth Explorer, which all include bus transfers. Before you travel, download their Heritage Hunter app, which is free to download from the App Store or Google Play. It features maps and information about the stations, railway history and locomotives, and there is even a Heritage Hunt. 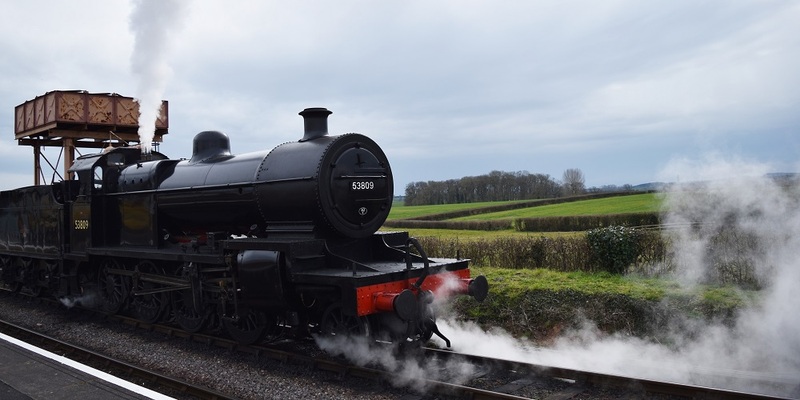 You can join the train at: Minehead, Dunster, Blue Anchor, Washford, Watchet, Doniford, Williton, Stogumber, Crowcombe Heathfield and Bishops Lydeard. Make sure you check the timetable if you really want to go on a steam train, as some trains on the service are diesel-powered. Get there early if you want to take photos with the steam train. The West Somerset Railway welcomes passengers who have a disability and any accompanying assistance dogs. Please check the website for their Accessibility Guide. Pre-booked groups of 16+ passengers enjoy discounted travel. Dogs are welcome on the West Somerset Railway. You will need to buy a £2 ‘Rover’ ticket – check out their dog friendly page for more information.